Gorlok hugs for an international cause. 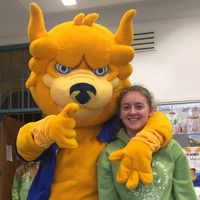 The Gorlok, Webster University's mascot, visited high school classrooms in Leiden in December to assist with their fundraiser for Free A Girl, an international nongovernmental organization dedicated to freeing young girls from forced prostitution, providing them with shelter and prosecuting their offenders. Students in the 10th grade at Leiden's Stedelijk Gymnasium chose to raise funds for the NGO as part of their Christmas fundraiser. How did the Gorlok help? Students could buy each other a hug by the Gorlok or a picture with themselves and the Gorlok, with the funds raised from this and other activities going toward “Free A Girl. Free A Girl was co-founded in 2008 by Roelof van Laar, a Webster University alumnus who attended Webster's campus in Leiden for the MBA program. Currently the organization hosts Webster Leiden students on internships and counts several alumni among its employees.